Are You Worried About Your Child’s Mood and Behavior? Is your school-aged child having difficulty dealing with emotions? Are you worried about your child’s success and lifelong wellbeing? Does your son or daughter seem overly rigid and unable to cope with change or unexpected situations, even if they are as minor as a last-minute trip to the grocery store? Is your child constantly seeking reassurance or predicting the worst-case scenario? Do you wish you could connect with and better understand your child so you can help him or her live a happy, healthy life? The symptoms of anxiety in children and the symptoms of depression in children can be confusing and frustrating to deal with for both children and parents. Maybe you’ve noticed changes in your child’s sleeping or eating habits, or you’re concerned that he or she is struggling to sit still, pay attention, and manage uncomfortable emotions. Your child might be having difficulty making friends or completing homework on time. Maybe he or she seems overly self-critical, lonely, and overwhelmed. It may be that your child’s meltdowns are getting in the way of your ability to run errands, fulfill responsibilities, and resolve conflict in the home. Or, perhaps your child is withdrawing and refusing to tell you what’s on his or her mind, and you’re worried that something is really wrong. Perhaps you feel frustrated and helpless, confused about your child’s behavior, and unsure how to help. Emotional difficulties in children are very common. About one in five, or 20 percent, of children struggle with mental health challenges that often manifest through outbursts, withdrawal, or worrisome changes in behavior. In fact, about half of the mental health concerns a person experiences over his or her lifetime manifest by the age of 14. If your child is having difficulties now, early intervention can lead to better outcomes not only in the present, but also for the rest of his or her life. There are many reasons why a child may begin demonstrating concerning behavioral or emotional changes. Sometimes mental health difficulties run in families. Children can inherit a sensitivity to developing emotional challenges or learn less than effective strategies for coping with life’s demands. Today, we are all are under a lot of pressure, whether it’s school, homework, difficulty with friends, or the ever disrupting presence of technology. These pressures often start at a young age and can persist with children throughout their lives to adulthood. By working with a child psychologist, you can help your child develop the skills and tools he or she needs to better understand and express thoughts and emotions and face life’s challenges with increased calm, confidence, and ease. Can you imagine a day without your child’s temper tantrums, tears, or refusal to cooperate? What if you, your child, and your family could enjoy peace, connection, and healthy resolution to conflict? I have offered counseling for children for over 10 years, and I know that even kids as young as five can learn about how their brains work, how their thoughts and feelings impact their actions, and how approaching sadness, anger, or fear in a different way can help them feel better. I adapt my therapy approach to best address and support your child’s unique personality, experience, and needs. Through using a tailored approach, I can best help your child problem-solve and learn healthy ways to express emotions. If your child finds it difficult to put feelings into words, we can utilize games, toys, and crafts throughout sessions. If your child prefers to sit and talk, I can help him or her feel heard and understood. Whenever possible, I will also draw on proven Cognitive Behavioral Therapy (CBT) techniques. CBT for children is highly effective, as children’s brains are malleable and adaptive, which means they are able to soak up information, make connections, and learn new skills quickly. Child counseling teaches children how to cope with upsetting emotions. When learned at an early age, these skills can make a huge difference in how a child’s brain develops over the long-term, and children become better able to identify and healthily respond to emotions throughout their lives. Parental involvement is a big part of therapy for children. I will invite you into sessions as needed, and you will always be provided with the opportunity to check in with me before and after sessions. By attending part or all of some sessions, you can get a better understanding of what your child is going through and learn effective tools for offering support and encouragement at home. You can also practice shifting your responses to your child’s behavior, which can help break negative patterns and increase cooperation and wellbeing for the whole family. No matter how helpless you may feel right now, your child can feel better. With the help of a child psychologist who understands how children think, behave, and learn, your child can reduce issues at school and at home. And, you can learn the skills needed to offer your child the tools he or she needs to thrive now and for the rest of his or her life. What if other people judge me or my child thinks attending therapy means he or she is different? Child therapy is completely confidential, and no one needs to know that your child is in therapy unless you choose to share that information. That said, therapy is nothing to be ashamed of. It can be helpful and beneficial for anyone, and seeking help doesn’t mean anything is wrong with you or your child. In addition, children generally enjoy working with me, and they’re unlikely to think anything is “weird” about going to therapy on their own. If your child does feel uncomfortable with the idea of therapy, it may be helpful to encourage him or her to think of me as a “coach”—as a person who teaches kids how to manage emotions just like other coaches teach them how to play piano or soccer. Will my child have to take medication? As a psychologist, I do not and cannot prescribe medication. If you’re interested in trying out medication that may help your child, I can work with you and an appropriate psychiatrist. However, when treating emotional difficulties in children, it’s recommended that most individuals try therapy before medication, as therapy can be more beneficial over the long-term. In sessions, I will help your child develop his or her innate strengths and feel more confident and powerful in his or her life. Will child counseling make my child miss school? I understand how important school is, and I offer after-school sessions to accommodate your child’s needs. However, sometimes those afternoon sessions are full, and your child may have to miss class to see me. If it were up to me, schools would teach most of the information and skills I provide in sessions right along with reading and math. Mental health can impact physical health and academic success. The knowledge your child can gain from counseling may be just as important for their success in life as the knowledge they can gain in an academic setting and can be vital to his or her overall wellbeing. If your child is struggling emotionally, he or she may already be finding it difficult to stay present and engaged in class. Attending child therapy sessions can help your son or daughter more fully engage in school, social events, extracurricular activities, and life as a whole. I invite you to click this link to sign up for my newsletter and blog. There, you can learn more about my practice and child counseling in Houston, TX. You can also take a look at these frequently asked questions . When you are ready to schedule an appointment, please give me a call at 713-702-3770. 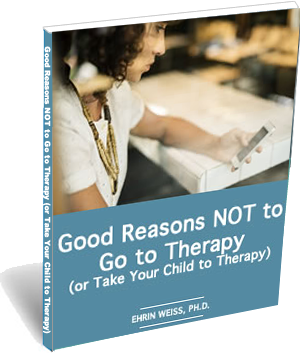 "Good Reasons NOT to Go to Therapy (or Take Your Child to Therapy)"